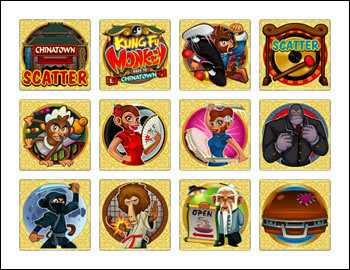 Microgaming’s creative team invites you to take part in Kung Fu fighting master class with Kung Fu Monkey Slots. You have a superb opportunity to perfect your techniques and to discover some new sides of the martial arts. Besides, if you are really highly-skilled and light-footed fighter, little monkey will make you his partner for attacking dangerous ninjas. Such high kicks and punches like Free Spins and Bonus Game will help you to escape unharmed and to get top jackpot of 2,500 coins or $25,000. While making your way to Chinatown, you will run across the following symbols: Brave Monkey, Baby Monkey, Monkey in Red, Monkey in Blue, Big Boss, Ninja, Baboon, Old Judge, Valise. Additional special symbols are: Kung Fu Monkey, Chinatown, Gong. You can choose among the following coin sizes: $0.01, $0.02, $0.05, $0.10, $0.20/ $0.25, $0.50. You can stake up to 20 coins per line that considerably increases your chances to win really serious amount. The minimum bet which allows you to cover all 15 lines represents $0.15, the maximum one represents $150. 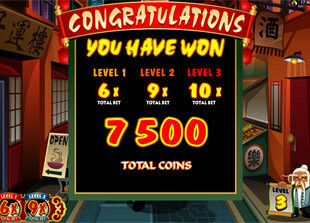 The highest Kung Fu jackpot is 2,500 coins or $25,000 for 5 Kung Fu Monkey symbols. 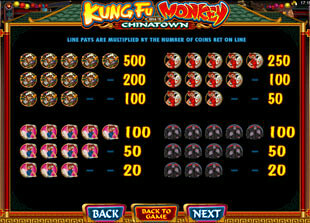 The second Kung Fu jackpot is 1,000 coins or $10,000 for 4 Kung Fu Monkey symbols or for 5 Brave Monkey symbols. The third Kung Fu jackpot is 500 coins or $5,000 for 3 Kung Fu Monkey symbols, for 4 Brave Monkey symbols or for 5 Baby Monkey symbols. 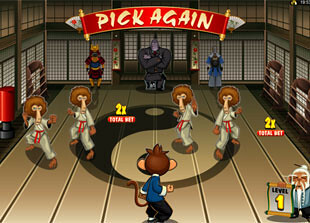 The wild symbol of the game is Kung Fu Monkey symbol. It substitutes for all other symbols of the game, except scattered Chinatown and Gong. To be more exact, this symbol can replace any missing symbol in your winning combination in order to make it complete. Pay attention, that this symbol acts on active lines only. 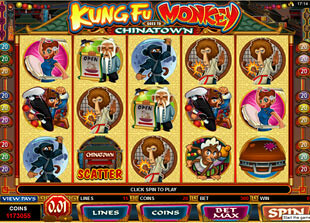 Kung Fu Monkey Slots has two scattered symbols: Chinatown and Gong. Both of these symbols pay independently on your selected active lines, what means that they can be scattered anywhere on the reels. They pay 1x total bet and trigger different Bonus Games. If you are lucky to catch 3 Chinatown symbols, scattered anywhere on reels 2, 3 and 4, you will be awarded with Kung Fu Bonus. If Gong symbols appear anywhere on reels 1 and 5, Free Spins feature is triggered for you. Free Spins. As we’ve mentioned earlier, 2 Gong symbols, scattered on reels 2 and 5, trigger 10 Free Spins. All the wins, including top jackpot, are doubled during the feature. More Free Spins with the same multiplier can be won during Free Spins. 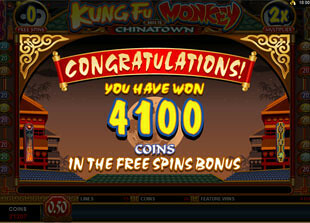 Free Spins and Kung Fu Bonus can be triggered simultaneously. Bonus can’t be retriggered inside of Free Spins. Bonus Game. As it was discussed before, 3 Chinatown symbols, scattered anywhere on reels 2, 3 and 4 trigger Kung Fu Bonus. In this game your task is to rescue baby monkey for big reward. You need to complete all 3 levels, what makes this game unbelievably exciting. Remarkably, game will bring you the win, anyway. Level 1. This level has 6 Baboons, ready for a fight with you. Five of them can be defeated, but one is undefeatable. You can start defeat them in any order. To pass to the second level, it is enough to defeat at least three of them. Moreover, any Baboon defeated multiply your current bet by 2x. If you choose undefeatable Baboon, you will be awarded with Free Spins, but Bonus Game will stop automatically. Level 2. This level has 6 Ninjas, who can easily leap through the air. Like in previous level, five of them can be defeated and one is undefeatable. To pass the advanced level, you should defeat three of them. Besides, any Ninja defeated multiply your current bet by x6. 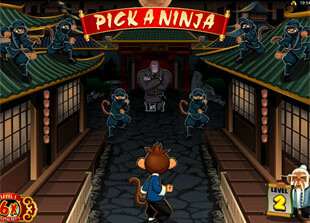 If you choose undefeatable Ninja, you will be awarded with Free Spins, but Bonus Game will stop automatically. Level 3. On this level you will face dangerous Big Boss, who is ready to attack you. To defeat this bandit, you should choose the right fight combo. Picking the correct fight combo twice will absolutely defeat this cut-throat. After the victory, you will take Baby Monkey and will get your enormous award. 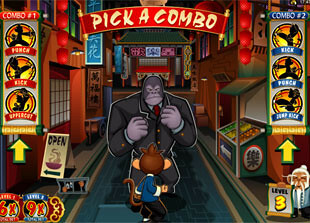 Kung Fu Monkey slot machine invites you to Chinatown for defeating ninja mafia and for rescuing baby monkey. Thanks to the incredibly striking Bonus Game you will feel like a real super hero.